So, I was hanging out at my fun friend Kate's house the other day and she was being diligent and cooking 4 nights of dinner on a Sunday. One of her entrees was baked ziti which had mozzarella cheese on top. As she was getting ready to cover it and put it in the oven, she mentioned that one of her favorite Rachael Ray tips was spraying the aluminum foil with Pam so the cheese doesn't stick. That Rachael has not only mastered the art of fast cooking but also smart cooking! And, thanks Kate. I always buy a lemon and a lime at the store each week. They keep well and the lemon usually ends up in food, while the lime ends up in a gin and tonic! I also keep green and black olive in my pantry. My favorite olives are at Trader Joe's . 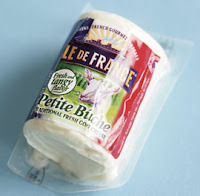 Place chicken breasts in a ziploc bag and pound flat - about 1/5 inches. In a shallow dish and squeeze ½ lemon over chicken pieces. Turn to coat chicken with lemon and set aside. In a shallow bowl, combine flour, garlic powder, oregano, salt and pepper. Dredge chicken pieces in flour. Melt butter in a frying pan and cook chicken over medium heat, turning until brown on both sides, about 10 minutes. Remove chicken from pan and place in a 9x13 inch baking dish. Squeeze remaining half of the lemon into the frying pan, along with chicken broth and stir, loosening pan scrapings. Pour over chicken. Cover with foil and bake at 350 degrees until chicken is done, about 15 minutes. Uncover and add olives. Top each chicken piece with crumbled feta cheese and parsley. Return to oven and continue baking, uncovered, until cheese is beginning to melt, about 10 minutes. Salt and pepper to taste. 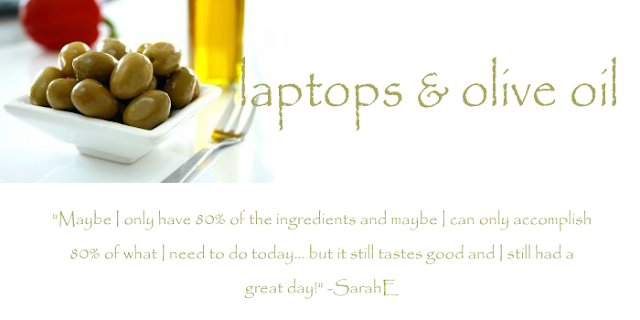 I found this recipe at Simply Recipes , one of my favorite food blogs. I must admit this recipe turned out REALLY well. I think the 2 keys are cook time and good ingredients. This was a quick and easy appetizer for a Friday night gathering. I liked that the meatballs did not create a lot of grease! In medium bowl, combine turkey, egg, garlic, onion, bread crumbs, chili powder and cumin. Mix well. Shape into about 36, 3/4-inch balls. Place crushed chips on plate. Roll each meatball in chips, coating thoroughly. Lightly coat baking pan (10 x 15-inch) with nonstick vegetable cooking spray and arrange meatballs on pan. Bake at a preheated 350 degree F oven for 20 minutes or until turkey is no longer pink in center and internal temperature registers 165 degrees F.
Sweet Basil! I loved this book~class! Everyone once in a while I go to a training class at work that I think that was worth every minute of time not spent in the "office". This past week, I had the opportunity to go through 2 days of Fierce training. No, there wasn't anything physical to it. It was about having conversations and about how they are the relationship. Have you ever said, "I just don't know how to talk to him/her about it."? It also goes into the concept that relationships steadily disintegrate, one failed or missing conversation at a time, which really resonated with me. Think about college friends that are no more or even failed marriages of friends..."all of a sudden it was like we weren't married anymore". The book I believe was originally intended for personal relationships but has crossed over into the business world, particulary as it relates to coaching and dealing with conflict. Quiche is a really easy dish and something that I often have ingredients for on a regular basis. Also, you can "mix and match" cheese, veggies, meats etc. Tonight I used swiss and cheddar along with some ham and green onions. I also don't make my own crust, but I prefer to use Marie Callender's crust which is made with vegetable shortening. Combine the eggs, cream, salt, and pepper in a food processor or blender. Layer the ham and onions, and cheese in the bottom of the pie crust, then pour the egg mixture on top. Bake for 35 to 45 minutes until the egg mixture is set. ~I cut the recipe in half. Pour 1 inch of oil into each of 2 large cast-iron skillets and heat to 350°. Add about half of the chicken pieces to the hot oil, being sure not to crowd the skillet. Fry over moderate heat until the chicken is golden, crisp and cooked through, 20 to 25 minutes; an instant-read thermometer should register 165° for thighs or drumsticks and 160° for breasts. Line the racks with paper towels and drain the chicken. Continue frying the chicken in batches, being sure the oil temperature stays at 325° during frying. Serve warm or at room temperature. So, here's where I didn't do so well. 1. I didn't have the proper thermometer. Meat themometers only go to about 200 degrees and I didn't have a candy thermometer -- don't know if there are thermometers for frying??? Hence, we ended up with Blackened Fried Chicken...didn't look so "buttermilk". I guess when they emphasize oil temperature that is for a reason! Would I try it again with the right thermometer...maybe, but KFC is sometimes too easy and a lot less mess! My mornings during the week have to run like a well-oiled machine if I am going to make it into the office at a decent time. Not having a lot of time to prepare anything for breakfast, I have definitely become a morning yogurt person. My favorite yogurt is Brown Cow especially Cherry Vanilla or Blueberry. It's not the super low fat stuff, but what's a few calories??? This yogurt is super creamy and reminds me a little bit of eating frozen custard. I have to buy it at a place like Whole Foods or Clintonville Community Market, one of the gems of my neighborhood. This little organic market is located in the middle of a residential neighborhood so I can walk there to pick up fresh ingredients, wine, beer, ice cream and of course, brown cow yogurt. The other cool thing about the market it is member-owned natural foods grocery store, so it's definitely not your typical grocery store experience! It's mid-week....should be a Wicked Wednesday, but I was late coming home and I had a jar of Vindaloo sauce from Whole Foods that I wanted to give a try. I also had chicken thighs, peas, and rice that I could use. Thus, I quickly browned a pound of chicken thighs (cut into 1 inch pieces), tossed in the vindaloo sauce and peas -- let it simmer for about 15 minutes while I cooked the rice. On a scale of 1-10, it was a 5 and a lot better than fast food! My fantastic SIL tipped me off to this stuff and it has saved me many mornings when my last suit etc. was too wrinkled to be worn into the corporate tower. (It is probably more critical in the summer, as it does a great job on my husband's cotton shirts.) This morning the jersey knit shell I was going to wear was looking pretty wrinkled...sprayed the Downey Wrinkle Releaser, jumped in the shower and then I was good to go. Dinner tonight needed to be super easy...I worked late and I had defrosted a pound of ground beef that needed to be utilized. I didn't want to do just pasta and sauce, so I got a little creative. 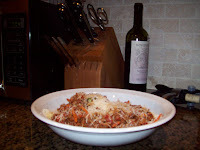 Add carrots, beef and spices -- saute until beef is cooked through. Drain fat if necessary. Note: When I do my weekly grocery shopping, I always buy a pound of ground round and replenish if out of sauce, carrots, onions, garlic, or celery. In honor of my late great Aunt Helen -- a sophisticated and well-educated woman of her time, I didn't do the typical superbowl food...wings, chips, burgers etc. Tonights dinner was filet, ore-ida crispers...yes, and a mixed beet and goat cheese salad. The salad was my favorite. 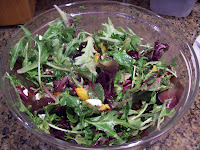 I used Gordon's Vinaigrette, along with goat cheese crumbles, and then yellow and red beets. Sprinkle goat cheese and beets over greens. Combine all of the greens in a mixing bowl, drizzle with the vinaigrette, and lightly toss. Season to taste with kosher salt and fresh cracked pepper. Lightly butter or spray 9- by 13-inch baking dish or something similar. 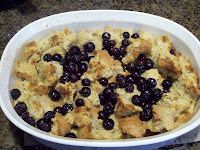 Pour in maple syrup; scatter bread cubes and berries in dish. In large bowl, whisk together eggs, milk, lemon zest, and salt; pour mixture and melted butter over bread cubes. Bake toast until puffed and golden brown, about 45 minutes. Transfer to rack to cool 5 minutes, then serve warm with maple syrup. "To build strengths, you must first discover your greatest talents." The book goes on to encourage you to make an "investment" in those strengths to get the most from them. This book is a fun and insightful way to find out more about yourself. And, it's an easy application in the workplace. I also encouraged Awesome Jen who is looking for a new career to take the assessment as she proceeds through her "adventure". It's a cold and icy night in Ohio. So, it's perfect for something spicy and warm. Sautee onions and garlic in oil until onions turn clear, about 5 minutes. Add tomato paste and black beans and reduce the heat to medium low. Add spices and stir to combine well. Cover and allow to simmer at least 20 minutes, stirring occasionally. Remove bay leaf. Slice polenta into 1/2 slices, dust with flour. Fry polenta in olive oil on medium high heat for about 4 minutes per side until heated through. Top polenta with black bean chili, sour cream, salsa, shredded cheddar, guacamole and fresh chopped cilantro. Cut avocados in half. Remove pit. Scoop out avacado from the peel, put in a mixing bowl. Using a fork, mash the avocado. Add the chopped onion, lime, chili powder, salt and pepper and mash some more.